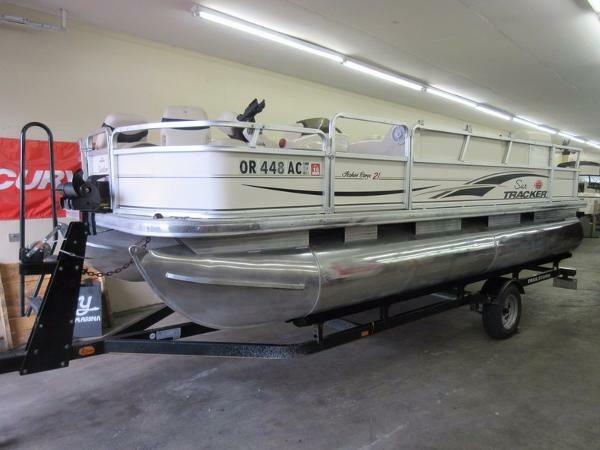 2008 Sun Tracker Fishin? 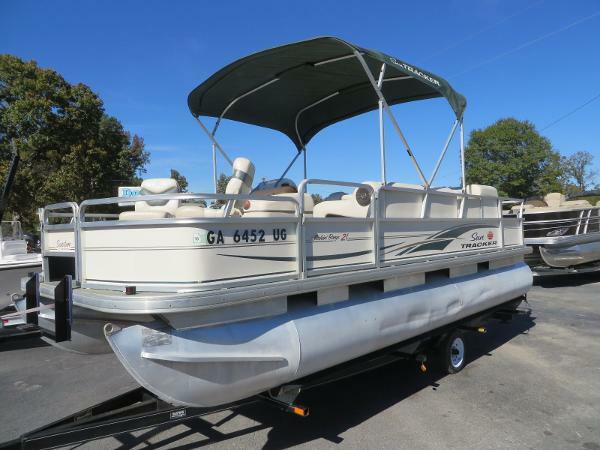 Barge 21 Signature Series The Sun Tracker Fishin’ Barge 21 Signature Series pontoon combines creature comforts and serious fishing features to create an exceptional family-fishing boating value. - ONLY 32 HOURS! 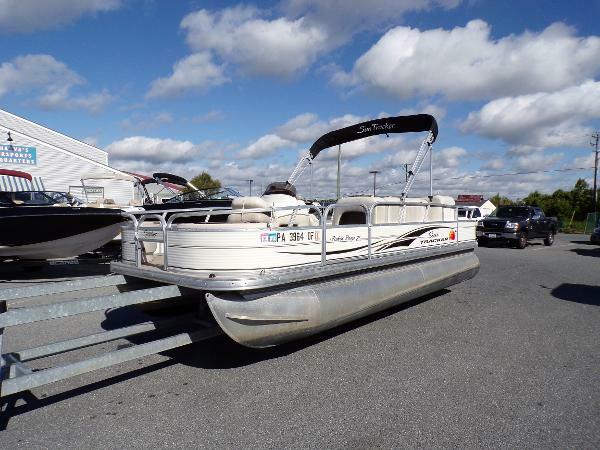 2006 Sun Tracker FISHIN' BARGE 21 Signature Series 2006 SunTracker Fishin' Barge 21 powered with a 25 HP 4-stroke EFI Mercury outboard. 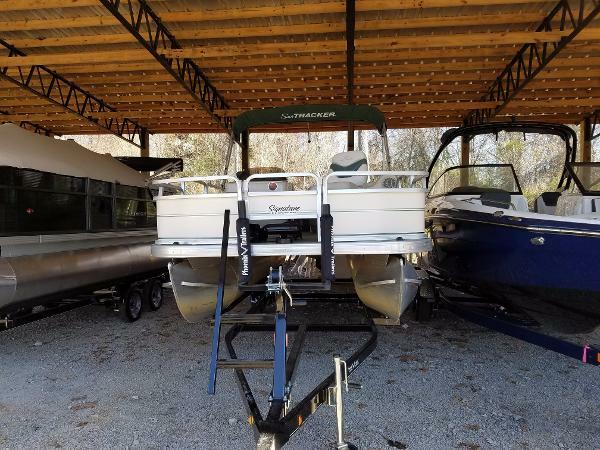 This boat does not include a trailer, but we have a Yacht Club trailer that will fit it perfectly if you want to make this a package! This boat has a cover and runs well. 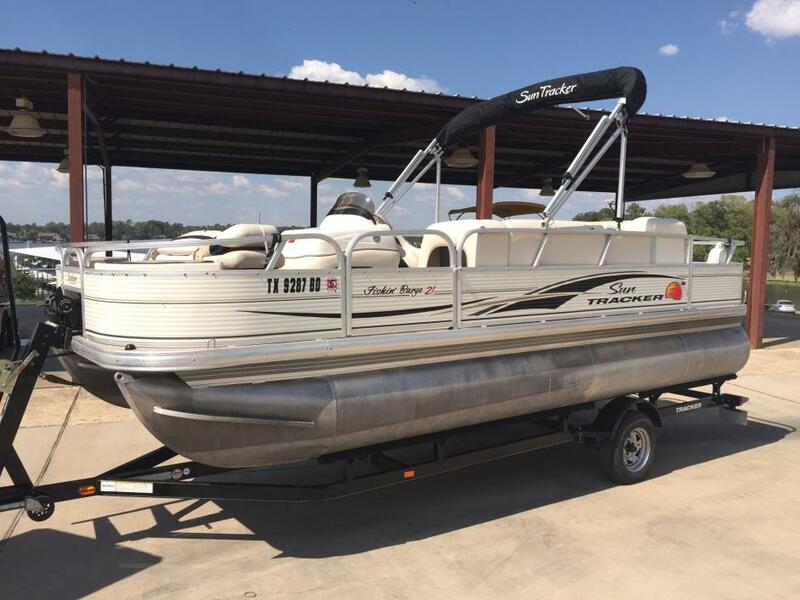 The Sun Tracker Fishin' Barge 21 Signature Series pontoon masterfully merges outstanding value, family-friendly amenities and serious fishing features to create an exciting, inviting boating experience. 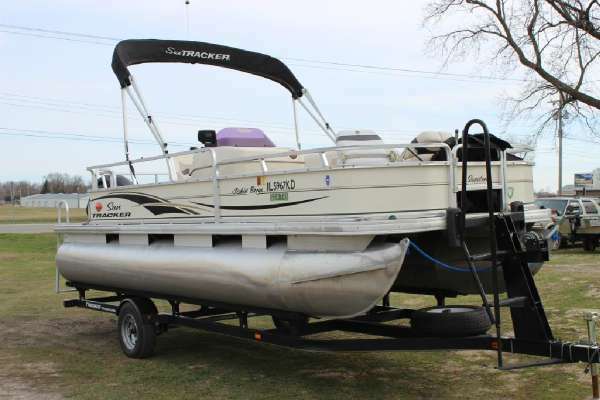 Anglers love the lockable rod box, vertical rod holders, three movable fishing chairs, dual aerated livewells, tackle storage, and spacious casting decks. 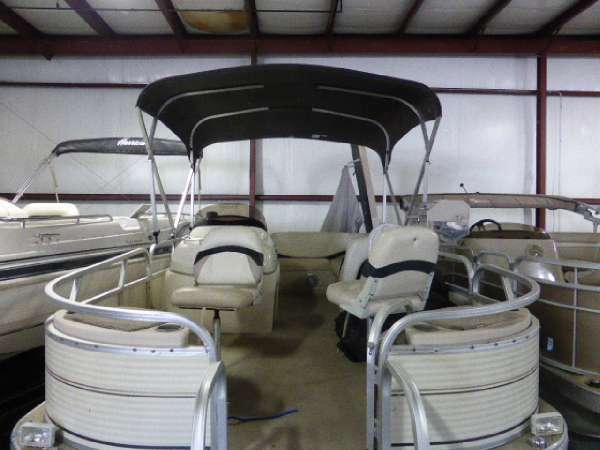 Switch instantly from "reelin' in the big ones" to "fun in the sun" with pop-up changing room, sundeck, L- lounge seating, removable table with drink holders, AM/FM/CD stereo with iPod connection, deluxe console with captain's swivel bucket, 36-quart cooler and 12-volt power outlet. 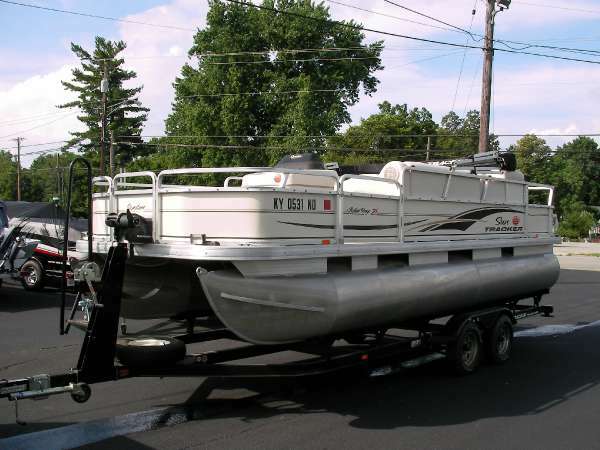 With Bimini top, Mercury outboard, and precision Mercury controls. Stop by the marina or give us a call if you have any questions! 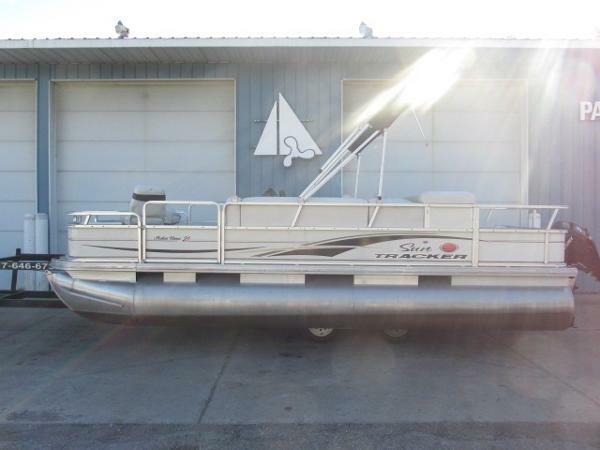 2011 Sun Tracker FISHIN' BARGE 21 Signature Series LARGER, WIDER 8.5' (2.59 m) DECK FOR 2011! Rides on 24" (60.96 cm) high-buoyancy, multichambered pontoon logs NEW LOOK & FENCE GRAPHICS FOR 2011! 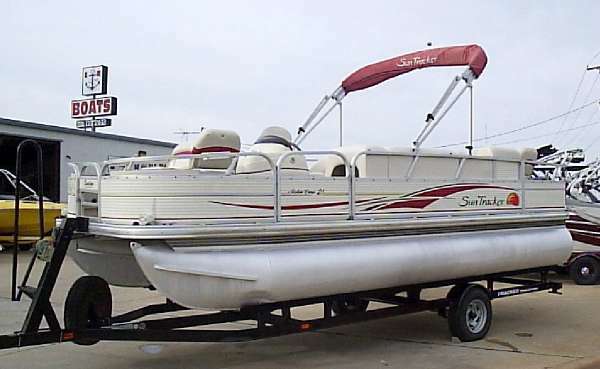 Extended all-welded aluminum motor pod for more usable deck space Bow fishing platformó2 fishing chairs w/NEW FOR 2011 secure screw-in pedestals, port side 8-gal. (30.28 L) livewell, starboard closed storage, integrated drink & rod holders ALL-NEW Aft fishing platformónow with TWO fishing chairs w/NEW secure screw-in pedestals, LARGER 16-gal. 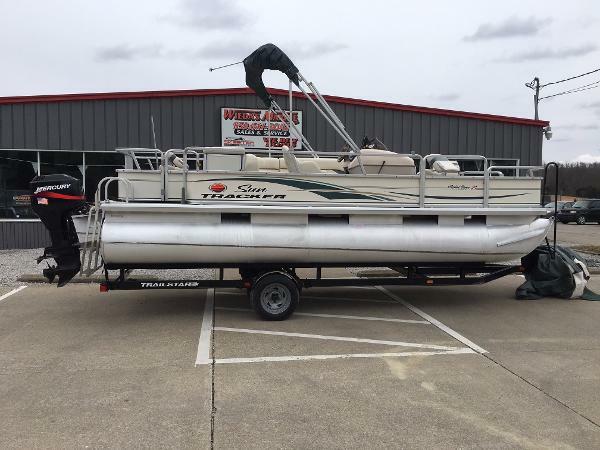 (60.56 L) cushion-top livewell w/baitwell insert & a cushion-top storage box, 2 rod holders & drink holders, NEW Aft deck vertical rod storage REDESIGNED top-loading starboard rod storage box for rods to 7.5' Captain's console w/wide swivel bucket seat, tinted windscreen, easy-read gauges, small items tray, trash receptacle, drink holders & storage space for a cooler (not included) AM/FM/CD w/MP3 jack (accepts optional Sirius Satellite RadioÆ package) Aft L-lounge w/underseat dry storage & NEW FOR 2011 locking armrest storage Removable serving/game table Color-keyed 9' (2.74 m) Bimini top w/drop-down changing room/privacy curtain Aft boarding platform w/non-skid surface & folding 3-step ladder Optional Fish Package w/LowranceÆ X50 DS fishfinder & MotorGuideÆ W55 Wireless Series 12V, 55-lb. 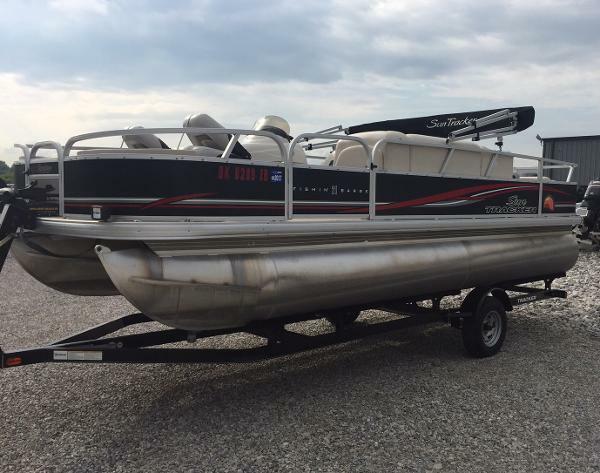 thrust trolling motor w/remote (battery not included) The SUN TRACKER FISHINí BARGE 21 Signature Series pontoon boat is America's NUMBER ONE favorite fishing pontoon. For 2011, we focused on building in even MORE ADDED VALUE and NEW FEATURES! Thereís plenty of room and activities for EVERYBODY! Grab your rods from the starboard rod box or the ALL-NEW vertical rod holders on the aft deck. Choose your bait from the NEW aft baitwell. So more people get to sit, we've added one more aft fishing chair for 2011. And when you start reeling íem in, not one, but two livewells will keep your catch alive and well. 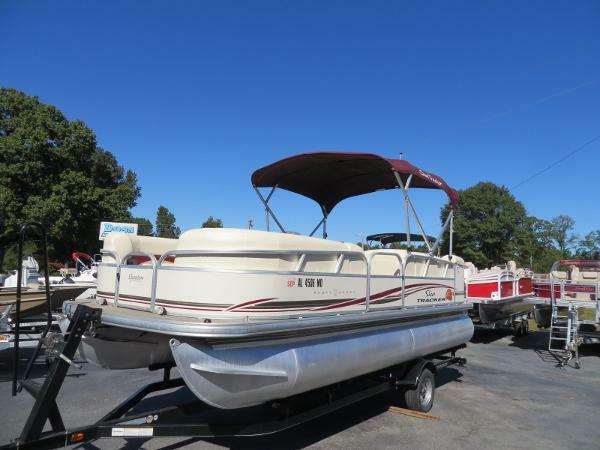 For non-anglers, thereís a spacious sundeck and L-lounge for relaxing, a removable dining and game table, AM/FM/CD with MP3 jack plus a drop-down changing room/privacy curtain. With all its new features for 2011, the SUN TRACKER FISHINí BARGE 21 Signature Series is destined to remain the all-íround favorite of families who fish!